Not much news lately so I must say few things about what is going on with my developed projects otherwise some may think everything is dead. My current priority is to finally get out that tile editor. The editor has evolved quite a lot since the last time I talked about. It is now more robust in the inside and more user friendly on the outside. One important low level change is updated graphics system for managing OpenGL drawing. This was something waiting to be done for some time and I decided to finally tackle it for the new application. To be more specific, I replaced my old graphics system based on OpenGL fixed functions (now obsolete) with a new one based on shaders. The new system should be more future proof and expandable with graphics features like normal mapping and lights (things no longer reserved only for 3d games). Another new feature of the editor are vector shapes. If you need to define paths or areas on the map you can’t really do it without vector tools. The editor provides four vector types: rectangle, ellipse, polyline and bezier curve. Vector shapes usually need some sort of information attached to them, so you can assign them custom parameters as is the case for all map objects. 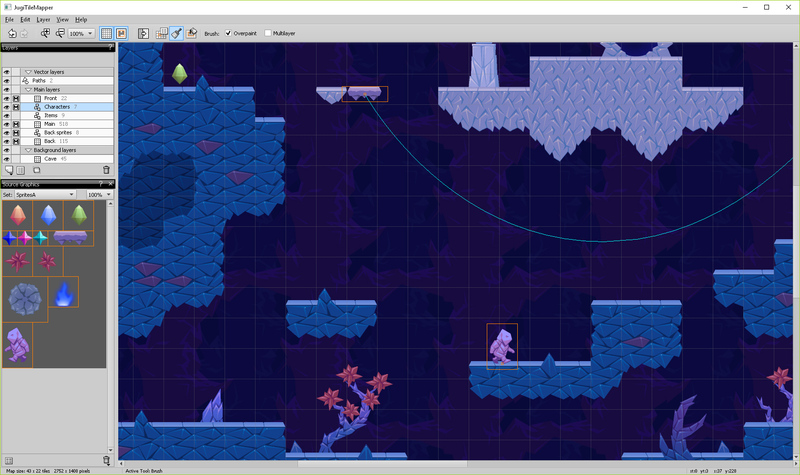 Here is the latest screenshot of my tile editor in action. I think this screenshot displays nicely one of the goals for the editor- minimalistic GUI. One big area for editing map and only essential GUI clutter around it! Another thing worth mentioning is the map itself. This is a small demo map which will be supplied with the editor. It will serve two purposes. First it will allow users to quickly test the editor features and how everything works. Second it will serve as a map used in code examples I plan to write for various (well, those more popular) game frameworks to demonstrate how the editor maps can be used in game development projects. That was some information about the tile editor. JugiPaint is for now on hold as I can’t work on both projects at the same time. But I can say that first new features for JugiPaint will correlate with the things I am doing now. I was forced to use Photoshop for the map above because JugiPaint lacks some essential features for doing tiled graphics! How shameful was that?